I thought it would be fun to hear from a Christian bookstore owner so I asked Kira Brant of Kira's Cottage in Franklin, Indiana to give us a peak into her world. Thanks, Kira! How did you get started in this business? Have you always wanted to own a bookstore? I actually got started right out of college. I had no plans originally of opening a store, but I was already designing my own line of Christian greeting cards and stationery . I was trying to market my products and I drove by a little shop in Greenwood, Indiana that was open. I thought to myself that it would be a great way for people to see my artwork. So, at first, I only sold my own products and artwork. I was there for a year, then I moved to a larger location and slowly started selling other items. We were at that location for 2 years, then I decided to move the store closer to home in Franklin, Indiana. It was then that the store really started to grow. I had a plan in place for what I wanted. I felt led to start selling more books and more Christian based items. We started adding bibles and curriculum. We are now a full service Christian book store. The funny thing is that I don’t have much time any more to design any of my greeting cards or stationery anymore, but I feel that the Lord has led me to what He wants me to do. I love it! What is your favorite part of being a Christian bookstore owner? Least favorite? My favorite part is meeting all of the wonderful people. I love talking to everyone and I have made so many friends. I have learned so much from people just walking in off the street. When I sit here and think of all the wonderful people I have met, I am so blessed. I also love the opportunity to get to work closely with my family on making decisions for products, displays, and things like that. Not sure what I would do without my family! My least favorite part is the money part of it. I don’t like the stress of paying bills! In what ways do you feel your store is serving the community? Any stories you would like to share? I am praying that our store is a refuge that people feel like they can go and feel safe and at peace. Some people come in here upset or worried because of something going on in their lives. We might now always have the perfect thing to say, but we always have hugs to give out and ears to listen. My family and I work hard for the store, but don’t be mistaken, the Lord has done all of the hardest work. We want to continue to follow HIS plan for Kira’s Cottage. What kind of books do you personally enjoy? What types of books sell best in your experience? I honestly love sappy romantic fiction! The kind of romance that happens in fairytales! You know, where the story has a happy ending, all of the problems that happened during the book get solved, and they all live happily ever after! Some friends in my book club call that fluff, but I love it!!! Right now in our store all genre’s of books seem to be selling well. Non fiction and fiction are both popular. Our customers are looking for good writing, period. If it is a non fiction book, they want to learn from it. If it is fiction they want to be entertained and feel drawn into the story. Is there anything you wish the publishing houses did better/differently? I wish that publishing companies would do more for the little independents. I feel like there is so much focus on the chain stores that they sometimes forget that the independents are just as important. What about authors? Is there anything authors can do to better help you in your business? I love meeting authors. I am an artist, but I never could write! I think it is wonderful that authors can weave together stories that will last forever! The authors I have met have been wonderful here in our community. We have had book signings and discussions and they are always so much fun. I think that when an author shows enthusiasm about his/her book and wants to reach out and discuss it, it makes me more interested in the book. Thanks so much for answering my questions, Kira! And a big congratulations on the opening of your new store. Any closing thoughts? Thanks so much Jamie! I think it is important to remember to do what you love and be open to new things. When I opened the store, I had no idea that I would be where I am today. I learn something new everyday about this business. I am so thankful to be able to sell books to our community and I am thankful that I have had the opportunity to meet authors that I wouldn’t have met if not for the store. I want to thank the authors out there who bring us the wonderful stories and teach us so many new things and ways to learn. If it wasn’t for the authors, us book store owners wouldn’t be here at all! The Christian bookstore owner is an important part in the process of getting great books that glorify God out to the world and we sure do appreciate hard working people like Kira! Any thoughts about bookstore owners? Can a sad story survive? My WIP has floated along, stopping to say hello but never staying to put down roots. It has been frustrating to write on occasion, because the subject matter is difficult. Believing it was supposed to be a book has burdened me. Recently I read about a woman who won a short story contest in Writer’s Digest. My heart started racing as I considered new potential outlets for this WIP. Perhaps is not meant to be a book at this stage? Ideas flitted about faster than I could process them. I could write my characters journey into a short story! My fiction piece wouldn’t lose value by being reduced in size to a more manageable work. At this stage of life, maybe short stories would be a viable option for this writer. I felt free. The pieces are fitting together in my mind as never before, suddenly “it” makes sense. By eliminating the pressure of a complete book, writing fiction once again feels life giving. I am going to focus on telling the part of the story that matters to me the most. Who knows? Maybe I too will enter a short story contest? The possibilities are exciting. More importantly, I can stay true to the nuance of this story. What it wants to be today. It can always expand later. I am not writing it for a market per se, but as a conduit to let these characters speak. I have been told that no one will be able to read a subject matter without a happy ending. I disagree. I believe people will connect with writing that peeks into their secrets, surprising them that they are not alone. Life doesn’t always end with closure, perhaps a story that doesn’t force a happy ending might be just what causes a reader to reflect…writing their own ending. Can a sad story survive? It can be a good read, and be a catalyst for change, even just for one person. If I allow God to use me to tell the story, He will certainly bring the reader who needs to connect through it. What are your thoughts? “I’m so frustrated. I didn’t get to write all day.” I complained to my husband. “Who’s in charge of your time?” he asked. “Ah… me…I think.” Wasn’t I? Didn’t I have the same amount of time everyone else did? Where did my time go? I knew there were other writers who were just as busy as me. How did they find time to write? That was a year ago. Since then, I’ve taken charge. Things have changed. It all began at a writer’s conference when I met literary agent, Chip MacGregor, who recommended Carolyn See’s book, Making a Literary Life, Advice for Writers and Other Dreamers. Carolyn’s 8 hour chili method boosted my writing output. Her method is this: “Write a thousand words a day—or two hours of revision—five days a week for the rest of your life, and write a “charming note” (that does not ask for a favor) to a writer, editor, or agent you admire—five days a week for the rest of your life.” Since I established these goals I’ve written one book, started another, and am sketching a third. I’m amazed at how many people I’ve met by sending charming notes, too. • Tiffany Colter, writing career coach, and recent interviewee at My Book Therapy’s Chat Session, said, “Time management begins with honesty. We need to identify our excuses.” What are your time wasters? Get a pen. Write them down. Pick one that you’re going to eliminate. Tape it to your computer. • Randy Ingermanson, aka the Snowflake Guy, recommended writing in chunks in his Advanced Writing e-zine this week. “I set aside a block of time dedicated solely to whatever I’m working on. During that time, I focus on what I’m doing. I don’t check e-mail. I don’t answer the phone. I’m surly to the cat. When the time’s up, I take a break. During the break I can check e-mail, listen to VM or pet the cat.” For 50 minutes he works straight through. “I learned this technique from Eben Pagan, a productivity guru. On your break, detach completely from your work. If you write one 50 minute chunk per day, five days per week, and you get three good pages, you’ll write a full-length novel of 90,000 words in 24 weeks.” Just think of what we could do if we work for two 50 minute chunks a day! • Keep a writing pad handy at all times. If you’re waiting in the doctor’s office, at the bus stop, in the pick-up line at school, or while you’re waiting for a train to pass, you can write a description of what you see, feel, smell, and hear. Title it. Keep it. Refer back to it when you’re writing a scene from that location. • Enter a writing contest. This will give you a deadline and force you to work toward a goal. If you win, you’ll get bragging rights. If you don’t, you’re still working toward your daily writing quota, and practicing. My husband no longer asks me who’s in charge of my time. He knows. I am. He figured that out when I learned how to delegate. I have more time now because he takes out the garbage, helps with the cooking, and does the dishes. What are your time-wasters? What time management tips work for you? I drink a lot of coffee, although not usually from Starbucks. But my characters go there. That's because it is a nationally-recognized name, and I like to use some recognizable brands to give my stories a sense of authenticity. But I know writers who are scared of using brand names. They think it will violate copyright or trademark laws, or they don't want to use the ® symbol because it can interrupt the flow of the story. I don't worry about any of that. You can't copyright names, so copyright law doesn't apply. You can trademark names, and Starbucks is a registered trademark. However, trademarks have a specific, limited purpose, so the protection the owner gets is much narrower than with copyrights. Trademarks protect against consumer confusion over the source of a product or service. Consumers use recognizable names and symbols to tell them that they are getting a certain quality or a product with particular characteristics. When you see the Nike swoosh on a pair of shoes, you expect them to last for a while. When a counterfeiter prints the swoosh on shoddy-quality shoes, people are mislead. That harms both the consumer (who is not getting what he or she expected) and Nike (who could lose sales to the counterfeiter and suffer harm to its reputation when the shoes fall apart). Your characters can drink 7-Up without worrying about trademark infringement. No one is going to go out and buy counterfeit 7-Up based on your novel, nor will readers assume that the makers of 7-Up are connected with your book. You don't have to call it lemon-lime soda. A brand name can lose its trademark protection if consumers use it generically for any brand of the same type of product. After people started referring to all tissues as kleenex and to photocopies made on any brand photocopier as xeroxes, the owners of those trademarks spent a lot of money educating consumers on the proper use of the terms. That's why brand owners would like you to use the ® symbol. But you aren't required to. If you want to help trademark owners protect their property and you think "the real thing" will add authenticity, just capitalize Coke. Before your summer schedule gets too busy, be sure to mark your calendar and plan to attend the next statewide meeting of the Indiana chapter of American Christian Fiction Writers. The meeting will be held on June 26th from 11am to 2pm in Fort Wayne, IN. We will be meeting at Halls Guesthouse, 1313 West Washington Center Road. Cost is $5 for members and $10 for non-members, plus the cost of your lunch. Please RSVP directly to Donna Rich. Speakers for this meeting will be Rick Barry, Ramona Cecil, and Michael Ehret. Rick Barry worked as an editor of textbooks for Christian schools before becoming involved in ministry to Russia. Rick has successfully published hundreds of articles and short fiction pieces. He has successfully crossed genres with his two published novels which include a historical World War II novel and a YA fantasy novel. Ramona Cecil is an award winning writer from Indiana. She is multi-published in inspirational Christian poetry, having over eighty of her verses published by a leading producer of inspirational gift items. In addition, she is a successful writer of inspirational romance novels including three books published by Barbour in their Heartsong line. All three stories will be rereleased in May 2010. Ramona also has a Christmas novella releasing from Barbour in September 2010. Michael Ehret is the editor of Afictionado, the monthly ezine published by American Christian Fiction Writers. He will share information concerning the ezine as well as opportunities for members to be volunteer reporters at the national conference in Indianapolis this September. I consider my eavesdropping ears a gift from God. My peculiar talent kicked in the night before one of my first ACFW conferences after I had just picked up conference materials in the nearly deserted registration office. An uncertain voice emanated from a small side room. "I'm new to this, you know. I'm not sure what to do." I decided to hang out until she emerged. Hopefully, I'd discovered a fellow late-arriving ignoramus who might welcome a dinner partner. Instead, the speaker's face jarred me. It matched a photo in my conference materials. This woman with the deer-in-the-headlights gaze was an editor in a major publishing house. "I've got a million appointments. How do I handle this?" The company had sent her, a newbie, alone on this important mission. Queen Red Ink, from the same company, was supposed to make the trip, too, but had the audacity to get sick at the last minute. I stole a glance at the woman's Loreal hair and make-up, her oh-so-sleek outfit. I just knew my shoe size was larger than her hip measurement. "You'll do fine." A seasoned editor patted her on the shoulder. "Listen and use your instincts. I'll pray for you." I should have felt Holy-Spirit-happy at this exchange. Instead, I wanted to yell, "Hey, I'm the one--not to mention several hundred other publication-hungry writers--who could use the prayers!" Editors don't need prayers. They hold The Power. And lots of them even have skinny hips. When I sensed a slight nudge in my conscience, I tried to find support for my attitude in the Bible. But the not-so-happy Holy Spirit informed me it wasn't there. In fact, since I tended to regard editors as opponents--almost my enemies--I should pray for them, as Jesus commanded. Since those early days in my writing career, I've learned a lot more about editors. I even count some of them as [gasp!] friends. The more I know about editors, the more I understand them. Reading addicts, they love books, just as I do. The majority hate to say "no" almost as much as I hate to hear it. And I've come to realize writers and editors both are riding the same crazy publishing industry train, clinging to its top like a multitude of cats to the same bedspread. (Sorry about the mixed metaphor, but that's the way I picture it.) We hope the thing will keep moving and take us to our common destination--which is to serve the Lord and His people through the writing craft. 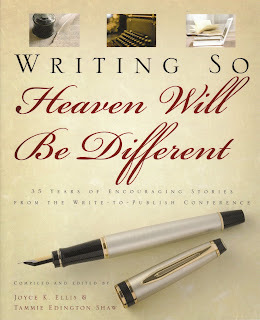 So when the Christian fiction-writing world descends on Indianapolis this September, I will pray for all, that God gives us servant hearts and the willingness to use good writing in whatever way He deems wise. I'll pray for writers. I'll pray for editors, too. Even those with skinny hips. 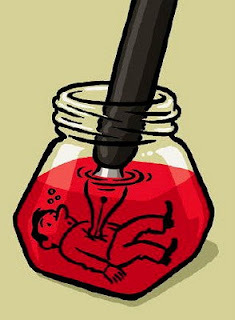 Great marketing ideas have been interspersed in many of the Hoosier Ink blogs I’ve noticed. Do our minds always simultaneously think ‘writing and marketing’ and ‘marketing and writing’? Maybe, but when I see the best authors out there marketing, I know we must. Sign up today if you’re not on their lists! This is only a fraction of the wonderful help available to us. Many ACFW members offer superb advice also: Mary DeMuth, Lyn Cote, Janice Thompson and Tiff Coulter, to mention only a few. Our ACFW website is a good resource. An ‘on-line presence’ is a must to complete our marketing tool chest. Some of us shine in this venue and some of us kick 'n scream about the necessity. It’s not going away. May as well be graceful. I just finished a helpful on-line session about using FaceBook for marketing. I don’t know the author of this quote, but it’s a good admonition. Many years ago I read a book by Edith Schaeffer called Hidden Art. Schaeffer talked about creating memories for our children. Now my grandchildren provide memories for me that find their way into my journals and into my heart. Many make me laugh. Some bring tears. All touch my heart. For example, I got to church one Sunday and sat with my daughter's family. I asked Stephen where his daddy was. "He's being a mushroom" was his answer. I thought I had misunderstood him and asked what he said. "Grandma Pat, I said he's being a mushroom." I finally received an explation from his mom. He was trying to tell me that his dad was ushering. Another funny one from my journal was one Thomas misunderstood. When it's raining you need an under brella. Then there was the time Bethani, just a toddler, couldn't stay away from the phone. I would take her away, tell her "That's a no-no," and try to divert her attention in another direction. When I this routine grew old, I started smacking her hand. One day while I cleaned up after lunch before putting her down for a nap, I heard the recorder. "You have two new messages." She was at it again. I went to the living room. She faced away from me. Not wanting to scare her, I very quietly said, "Bethani." She jumped, threw the phone across the room and smacked her own hand. I hurried out of the room to laugh. Then there was Joey, the five-year-old preacher. His mom overheard him talking with my dad, his great grandfather. Dad was dying and Joey wanted to be sure to see his beloved grandpa in heaven. He went through the plan of salvation like a pro. Dad responded by saying, "Joey, I know you believe what you just said. But I'm not sure I do. You could be wrong, you know." Joey's wise words -- "But Grandpa, what if you're wrong?" That's one of those tear jerkers. Praise God, that's not the end of the story. Two days before Dad died, my youngest daughter was alone with him in his hospital room. He was in the last stage of Alzheimer's disease and had not respoonded to anything. Nana took his hand and said, "Grandpa, I don't want to tell you goodbye. I want to be able to say, 'I'll see you in heaven.'" He squeezed her hand and gave her a wonderful smile that gave us hope. So, keep those journals. Put those moments in writing. Don't forget them. They can make you smile and give you hope. In addition, as you share them in your writings, perhaps they will encourage others. When you leave this world for greener pastures, what is it that you want people to remember about your writing? Your dramatic dialogue? Your stunning settings? Your captivating characters? How about possessing the title “the greatest bad writer who ever lived”? Uh, what? This is what author Nick Page, in his book In Search of the World’s Worst Writers, writes about Amanda McKittrick Ros. Ouch. Ros, an Irish author who lived from 1860-1939, predicted that she would “be talked about at the end of a thousand years”. I’m not sure that’s what she had in mind. Her work took center stage at gatherings of the Inklings (which included C.S. Lewis and J.R.R. Tolkien), where members attempted to be the one to read for the longest time while keeping a straight face. It is rumored that her fans included the likes of Mark Twain and Aldous Huxley. However, Twain was quoted as calling her first novel, Irene Iddesleigh, “one of the greatest unintentionally humorous novels of all time.” Maybe her notoriety stems more from a macabre fascination rather than from admiration. The kind of pull that draws you to gawk at a bad wreck. The primary objection to her work seems to be its deep “purple” hue. Yep, the infamous “purple prose”. What exactly is purple prose? It is writing that is too flowery, too melodramatic, too descriptive, too cliché. It is over-the-top narrative or excessive alliteration that draws attention to itself rather than drawing the reader into the story. Purple prose breaks the flow of the writing and irritates the reader. Basically, it is writing that causes people to sigh and roll their eyes. Yikes. During the Roman Empire and beyond, purple signified royalty. People unable to afford the cloth, yet still anxious to climb the social ladder of the day, would sew purple patches onto their clothing. Seen as gaudy and ostentatious, calling something “purple” came to signify anything inappropriate and in poor taste. Some genres struggle more with purple prose than other. Often purple prose can be found in romance novels. Trying to find new and creative ways to describe the physical characteristics of an individual can lead a writer to develop some eye-rolling-inducing statements. Ros, for example, called eyes “globes of glare”, legs “bony supports”, and sweat “globules of liquid lava”. Yuck. Writers run the risk of resorting to purple prose when trying to manipulate readers rather than connecting on a heart level with them. Our goal as writers should be to touch the hearts of our readers through vivid and dynamic writing, not manuever them in to feeling some emotion through a gaudy imitation. You could argue that Ros made a success of her writing career. Her out-of-print books sell for $300-$800 on the used-book market, a biography released in 1954, portions of her works were published as an anthology in 1988, and she was the honored at an Irish literary festival in 2006. Hmmm. Maybe if the writing thing isn’t working for you, you can aspire to a new height—unseating the Princess of Purple Prose. Anyone want to give it a whirl? I have to confess, I surely did enjoy my years as a news reporter. Excitement, comedy, tragedy, drama -- and that was just the Modoc town board opening bids for trash removal. All to be boiled down for a story in the next day's Winchester New Gazette, which was still a daily back then. One of the reporters from the "big city" paper, the Muncie Star, befriended me and shared some tips and tricks for news writing. She and later editors all talked about how "said" is invisible to the reader. Not only do we skim right over it, but it's neutral unlike other attributions. But I liked action words like "snorted" and "chortled," "thundered," "alleged," "snarled" and a whole lot of others that I thought really jazzed up my stories. No one but me liked my lively style. Some editors cringed and some cussed but they all agreed that "said" was about all that needed to be said. Neutral and invisible. If we fast forward a few years, past the Peru Daily Tribune and The Farmer's Exchange, I almost feel like I am learning how to write all over again since I am working on fiction. Sometimes we don't even need an attribution. I have been trying to use action beats instead, as long as it's clear what's going on. I could write, Larry the city editor snarled, "What is this stuff? Were you on drugs when you wrote this?" Or I could say, Larry threw down his blue pencil and ran his hands through his sparse hair, clenching his fists with tufts of dishwater blond poking out. He glared at the cub reporter. "What is this stuff? Were you on drugs when you wrote this?" He lurched his swivel chair across the aisle to Mary Jo, who was just lighting up a Camel. "I need a whiff of that, MJ. Just some side-stream ... now's a really bad time to quit smoking." As I wrote this, I thought it was about attributions. But, looking back, maybe it's also about mentoring less experienced writers as well. Later on I appreciated all of my editors' time and input and friendship. I think that's one of our strengths as a group, something I have appreciated. If I Were A Butterfly… Or Was I? I learned about subjunctive mood in Spanish class. I never heard it mentioned in any English classes (and I was an English major), so if it’s new to you, don’t worry. The point is we all misuse it, and as writers we need to master it. A verb mood is different from a verb tense. Tense demonstrates time (thus we have present tense, past tense, future tense, etc. ), whereas mood indicates a state of reality (or lack thereof). I won’t confuse you by bringing up all the other moods—today is about the subjunctive mood and we don’t give a hoot about the others. Hang on, you said you’d read this all the way through. Didn’t you? *whine* Okay, look for the big clue word IF. The subjunctive is most commonly used in connection with that little two-letter word, so begin with it. If, if, if. Got it? If the word if denotes something is hypothetical and it ain’t reality, then use the subjunctive verb WERE. So… If, if, if plus were, were, were. Simple, huh? If I were a rich man (reality is I’m not), I’d pay off the national debt. If he were to find the clue (as of yet it’s not a reality), he’d be a hero. If Chris were a girl (no way), he’d be afraid of spiders. If I were to wear a mini skirt (Ha! Me? ), I’d never stop blushing. If I was a rich man (I am), I had to have an heir. If he was to find the clue (somebody set it up so he couldn’t miss it), I was in trouble. If Chris was a girl (the possibility exists), I’d better give her a private room. If I was to wear a mini skirt (I’m obliged), I had to buy it today. Uh, yeah, let’s end the lesson there Other uses of the subjunctive mood exist, but your editor probably doesn’t know them, and that’s what they hire proofreaders for. But I’m not letting you off the hook. As a writer, you CAN, you MUST, conquer if, if, if plus were, were, were when the context of the sentence is a lack of reality. You know, if I were a fairy, I’d wave my magic wand and you’d get it. But guess what? A few years ago a bunch of writers who call themselves ChiLibris decided to write a collection of stories to demonstrate how different writers can take a single idea and weave just as many unique stories. But they also show another concept in these stories and that is how they can take a single line, "The wind was picking up," and go from there hooking readers with their second line, and the first paragraph.They may all start with the same first line, but how did they each make that line his own? Don't be afraid to share your first lines here in this exercise. What would YOU do if you were given an assignment like this? These were short stories, but the same thing happens with a long story, too--even nonfiction pieces must have that lead, that hook, that opening line which pulls you to read the next paragraph, sink $14.99-$29.95 into yet another book, turn the page even though you're supposed to be meeting with your honey at that restaurant. Wouldn’t you love to have a dollar for every time you say you’re a writer, and someone pipes up with, “Oh, that’s so cool. I want to be a writer, too”? Now, at this point, it’s nothing but a tribute to our sheer Christian charity (or patience, or naïveté—take your pick) that most of us actually play the game that follows. Smiling sweetly, we ask the question to which we probably already know the answer. Reflexively, you’re probably nodding, because we all know this wannabe is making two key mistakes. First is, of course, relegating anything in your life to “someday.” We all know that day never comes. Second, also obvious, is that to be a writer, you need to write something. I know, I know. Crazy, but there it is. Go figure. Only when we start actually doing the job…we don’t like it at all. I call it the Bright Shiny Object syndrome. Bright Shiny Objects are everywhere; they’re gigs with great-sounding titles or trappings—but the actual essence of them isn’t bright or shiny. It’s just plain work, sometimes work that—at its heart—is something we actively dislike. And every Bright Shiny Object in writing has them. Being a columnist is “cool”—struggling with relentless deadlines, not so much. Being an editor is “cool”—having really awful writing to fix, when you didn’t buy it in the first place, not so much. Being a consultant or freelancer is “cool”—having a client stiff you for payment, not so much. A friend of mine is fond of saying, “Anything you think you want, remember—if you get it, you also get What Comes With It.” Many of us have discovered this to our chagrin; that while we like certain parts of the writing life, certain elements make us cringe. In other words, successful people do What Comes With It. They take the grunt work with the glory...the Brussels sprouts as well as the chocolate pie. So if this writing life isn’t sometimes all it was cracked up to “be” in your mind—if you’re dealing with nagging irritations, blocks, or other obstacles that get in the way of your bliss—you might need to do some honest assessment of what you thought you were getting into. Were there things involved in this career that you didn’t know about before you started writing? Or did you know about them but thought you could get away without doing them—or that someone else could be persuaded to do them for you? The bottom line is, no matter which step is your next one in this writing life—be careful what you ask for, or what you think you want. Try to learn all that Comes With It before you leap into any opportunity, no matter how much you “think” you already know about it. Nothing’s worse than grabbing for a Bright Shiny Object, only to discover too late that it’s actually a ball and chain in disguise. *Except for the Brussels sprouts. I actually love them, so you can pass them on. 1. Use your gift of writing to worship God. 2. Enjoy the writing adventure (and its surprises). 3. Keep learning from the pros. 4. When disappointment happens, press on (like Paul). 5. Be open to publishing options you may not have prevously considered. Traditional large publishers aren't your only choice. I learned about self-publishing at a writers conference, and have found it a viable option for me (so far). I'm still working towards my goal of signing a contract with a traditional publisher. But meanwhile, I've sold several thousand of my self-published books (mostly when I speak about the topics of my books), enough to establish my own little company, Millie's Books. 7. Be prayerfully assertive. Good manuscripts and books need good promotion. I've learned so much about promotion and marketing at writers conferences. (I didn't say I've put all I've learned into practice yet, far from it!) For example, I've learned the fun of exchanging business cards, and the importance of having a website and a blog and being on Face Book. But most of all, I've learned to be grateful for the doors God opens for me with little or no effort on my part. As I've worked on these habits (and others), I've paraphrased my life verse for specific writing and publishing encouragement: And we writers know that God works in all things for the good of the writers who love God, and who live according to God's purpose (Romans 8:28). My very first publisher’s rejection was a red-letter day on the calendar of my life. I was ecstatic to learn someone had actually read my work. It didn’t matter that the response was short and negative. Your work does not fit our current needs at this time, it said, but I had a publisher’s letterhead with my name on it, and I was so grateful I taped it to my office wall. As you might guess, my enthusiasm for rejection letters has dwindled considerably. Currently, I’m more like Pavlov’s dog, where the sight of a publisher’s envelope in my mailbox triggers my chest muscles to tighten and my stomach to clench even before I open it. Yet, rejection letters are an important part of the publishing process, and like them or not, we must deal with them. The biblical Hezekiah offers an alternate example of dealing with unwanted mail. Hezekiah was already having a bad day when he received the letter from the King of Assyria (Isaiah 37), which was more like hate mail. Yet, Hezekiah didn’t take the letter personally. Instead, he spread the letter on the altar before the Lord as if it was God’s mail and not his own. In response, God sent His angel to battle Hezekiah’s enemies and Hezekiah came out nicely in the end. I don’t think it is unreasonable for the writer to take Hezekiah’s example and apply the same principle to rejection letters. If God has called you to a writing ministry and you've done your absolute best on the submission, then it’s fair to lay that rejection letter out before God and say "God, this isn't about me. This is a rejection of the ministry you have given me, and I leave the future of this work in your hands." Remember, if it is truly a ministry of the Lord, then you are not responsible for the results. The writer’s responsibility is to do his or her best work—God will take care of the results. You cannot do His part, and He will not do yours. Does Grammar Leave You Comma-tose? Recently after realizing how far I’d strayed from being “comma-tically” correct, I sent my manuscript for a grammar edit. There are many rules about commas however due to space constraints I’m limited to sharing five. Since I was in a time crunch I’m eternally grateful to Sarah for performing that editing feat, however, I thought it was time I brushed up on my grammar and hopefully some reader will benefit. RULE # 2: Place a comma before and after a conjunctive adverb that falls amidst other words in the sentence. “However” is the conjunctive adverb which affects the entire clause not just one verb. Those who love commas know where to put them, but those who don’t would like to make a few suggestions. RULE # 4: Commas separate items in a series of three or more words, phrases, or clauses. If you still don’t believe commas are important, compare the examples below. I’m positive Grandpa has a definite opinion about comma placement and you would, too, in this instance. RULE # 5: A comma offsets a noun in a direct address. It is plain to see the mild-mannered and ordinary comma can save lives. Given this truth, we should all be grateful for grammar, grammar police, and the fact that we don’t have to verbalize commas when we speak or we’d all be covered in spit. What are the comma frustrations you face? My curiosity got the best of me in 1994, when my cousin showed me the marriage and birth writings in the front of my grandmother’s Bible. My quest to find the spiritual heritage in my ancestry had begun. For approximately twelve years after that, between writing and homeschooling, I traced genealogy. I proved (with census records, birth, death, marriage certificates) my Civil War, Revolutionary War, and Mayflower descendants. I now share an honor with fellow authors, Henry Wadsworth Longfellow and Laura Ingalls Wilder of being Richard Warren’s descendant. I also descend from Francis Cooke since Richard’s daughter, Sarah married John, Francis’ son. Grandma Moses, folk style painter and Orson Wells share in Cooke’s genealogy. Richard Gere and I are in both lines. Now my days are spent using the information I gleaned over the years to craft my historical pictures. From glimpses of my coal miners in Clay County, Indiana, to my French heritage in lower Canada, ideas abound. I once did a road trip that took me to Juniata, Huntingdon, and Mifflin counties in Pennsylvania. From there, I took a side trip to Gettysburg on my way to Springfield, Massachusetts. From Springfield, I traveled former Indian trails that propelled me up into Vermont to Rutland and the surrounding area. 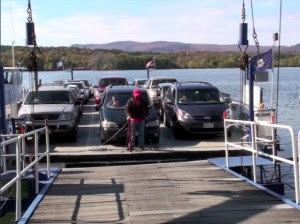 On the next leg, I took a car ferry across Lake Champlain to Ticonderoga, New York, to research my blacksmiths there. Near the end of my journey, I traveled down to Montgomery County, New York, to research my railroad man and other ancestors who traveled from there through canals and on wagon trains up to Outagamie, Wisconsin. Yes, on a separate trip, I went to Wisconsin to find marriage licenses, but that one elusive record in St. Louis still calls my name. Even if you’re not a genealogy nut, excellent resources abound for those of you who write historical novels. If I gained nothing else from all my years of hunting, I achieved the skill to research, and I love it. Obviously, the number one resource for history is local libraries. The Allen County Public Library in Fort Wayne has the second largest genealogy repository in the United States. Check out historical societies and the Indiana Room in your local library for historical books and microfilmed newspapers. The Indiana State Archives in Indianapolis holds many secrets like my grandmother’s adoption papers. Verify everything you read online before using it. One good site is www.usgenweb.org. This site holds treasures from every state in the United States, and it is free. You’ll never exhaust their offerings. Another fascinating site is www.cyndislist.com a free site that links you to records across the world including ship lists. I hope you and your family have a restful, blessed, and memorable EASTER! My critique partners are ruthless. Blunt. Demanding. If they don't tell me what's wrong with my work - how will I learn? My strength in writing is content. I have plenty of topics to write about and copious amounts of information to share. But often, I am far, far too wordy with my wordiness of words. "You already used that word 65.6 times!" I fall short of helping my critique partners as much as they help me. They are the nit-picky, detail oriented crowd. I'm the big picture maven. That's exactly why I need them. It's painful. I get frustrated with my limited abilities. But I truly believe they are divinely appointed by God to help me. He brought them into my life. How grateful I am for such gifted "critters!" I might not be able to spill as much red ink for them as they do for me (mainly because they are writing geniuses), but the one thing I can do, is pray. I pray for their manuscripts, the anointing of the Holy Spirit to inspire them, and for God to "enlarge their coast" (1 Chronicles 4:10) so that their work will sell. I also pray that they'll be anointed when they critique my work. And that they'll be in a very good mood.